I remember being right where you are. As soon as I got that positive pregnancy test, I started wondering “When will I start showing“? At first, I DIDN’T want to show because I wanted to keep my pregnancy a secret from most people until after the first trimester. The after the first trimester, I was tired of hearing that I didn’t look pregnant. Just a public service announcement. Just because someone doesn’t look pregnant, doesn’t mean that said person isn’t just as pregnant as anyone else. Related: Nervous about birth, breastfeeding and keeping a newborn alive? Check out these online courses for first-time parents. Why are you wondering when you’ll start showing? One reason might be because you want to FEEL pregnant. When you move over to your second trimester, it’s possible that your horrid first trimester symptoms are over and now you really don’t feel pregnant! And while that might sound glorious after some rough morning sickness, when that’s paired with not looking pregnant, it can be a little concerning. Still dealing with morning sickness? Check out Amazon’s Best-Selling Morning Sickness Remedies. You can also check out my favorite morning sickness teas. Reason #2- You can’t wait to take weekly pictures of your growing baby bump. If this is you, I have the perfect DIY Pregnancy Journal for you! I created this journal to help pregnant mamas document their pregnancies in a real, honest way. When I was pregnant, I struggled to find a journal that was more than just milestones and facts. I wanted a journal that would tell about how I felt. A journal that would help me to talk to my unborn baby and share all of my thoughts, wishes, fears and emotions with my child. Reason #3- You are tired of explaining why you can’t drink a glass of wine, or eat that cold cut sandwich, or eat your favorite sushi roll even though it’s obvious that you REALLY want to. If you had a cute baby bump going on, there would be no explanation necessary. Reason #4- You really, really want to be past the “hmmm, I wonder” phase. You see the looks from strangers in the store, wondering if you’re pregnant or if you simply binged on a lot of cheesecake last night. Or maybe you’re just really dying to wear some maternity clothes. Of course, there is not one simple answer when it comes to when you’ll get your first look at your new baby bump. But there are some indicators that can help predict approximately when you can expect to start showing. Why don’t you start documenting your bump now? 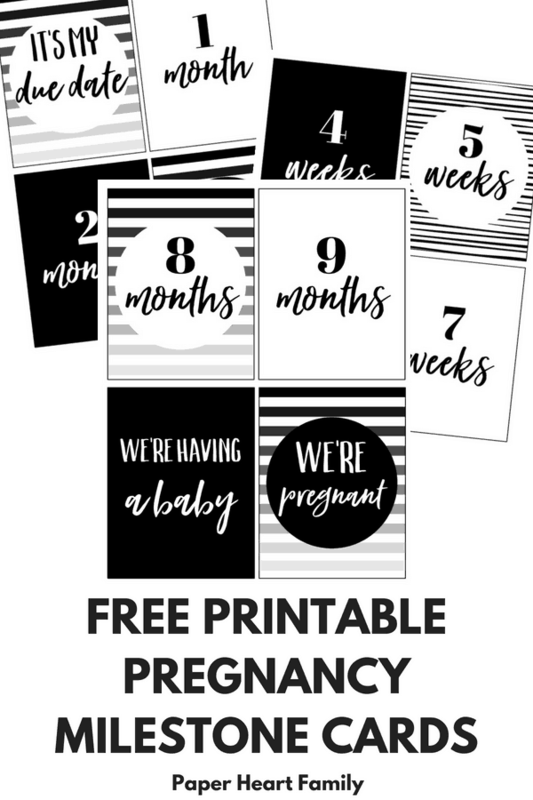 These free printable milestone cards are perfect! Simply print, cut them out, and whenever you take a pic of your growing belly, simply hold the corresponding card along with it! When will you start showing in your first pregnancy? If you’re a soon-to-be first time mom, I know how excited you must be for your bump to finally arrive. It’s the only time in your life when you’ll actually want weight gain. I remember feeling like it was taking forever, and then practically overnight, there it was! First time moms typically start to show around 12-16 weeks. In my opinion, that estimate is a little early, but what do I know? And if you lurk in any pregnancy forums, most moms say that it wasn’t an obvious baby bump until around 20 weeks. It’s also unlikely that you will begin developing a baby bump in early pregnancy before 12 weeks. You can however, expect to gain an average of five pounds in that time. That would be from bloating (not from your baby yet!) caused by good old pregnancy hormones. If your waistline is changing in the first trimester, it’s probably bloat or your expanding uterus. Your baby is still a tiny embryo, even at 12 weeks! Read: How Much Should I Gain During My Pregnancy? Being short or having a short torso. Baby simply won’t have as much room! If you are thinner (and DON’T workout regularly). If you don’t have a strong core to hold your baby and uterus back, you could show earlier. Genetics. Genetics can play a big role in how quickly you’ll start showing (among other things like how quickly you’ll bounce back, skin elasticity, etc). Being younger. If you’re a younger first time mom, you’re core is probably stronger than the core of older moms. You have tight, strong abdominal muscles. You are tall and/or have a long torso. 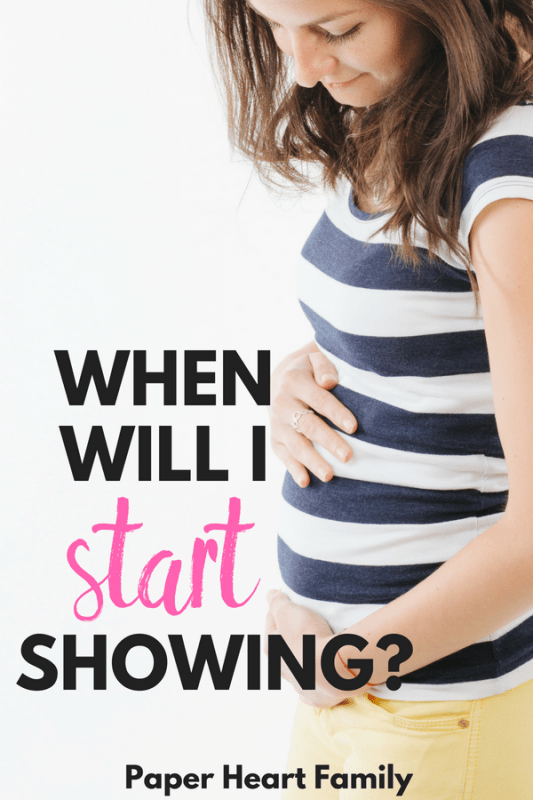 When do you start to show in your second pregnancy? If you’re pregnant for the second time, are you going to be able to keep the secret until the first trimester is over? It might not be that easy this time. It’s kind of like riding a bike. Your body doesn’t forget how to do it. The same goes for preparing for pregnancy. Your body did it once before, so this time, it’s highly likely that you’ll show much sooner. Your uterus and abdominal muscles are already warmed up and ready to go. Not so fun fact: Your uterus is forever changed and will never go back to its initial tiny size. Wah. You could show up to a month sooner than with your first pregnancy! Do you show earlier with twins? Hmmm, you probably already know the answer to this question. If you are having twins, yes, you will likely show sooner. In the first few weeks of pregnancy, your uterus begins to expand. In the case of two or more babies, your uterus expands more (and more quickly) in order to accommodate them. Pregnancies with multiples can start showing as early as 6 weeks! Wherever you’re at, and regardless of what this post says, try not to worry. 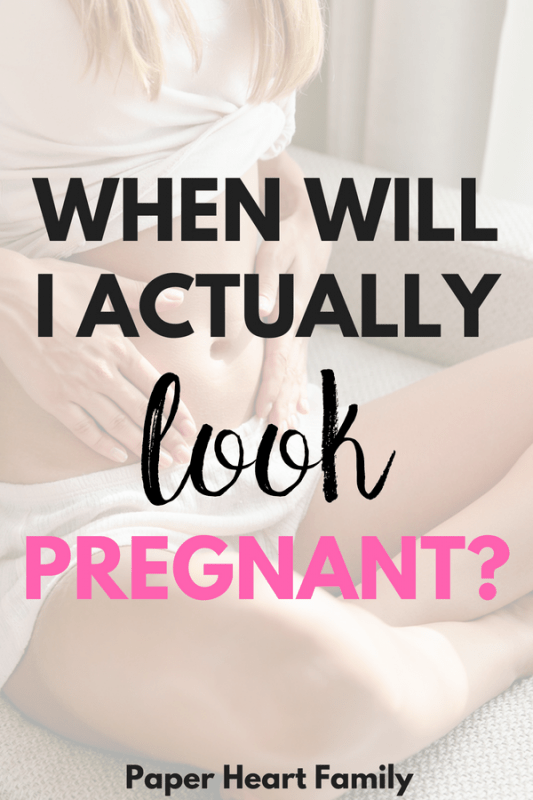 Maybe you have all the signs that point to showing early, but your pregnant belly is still hiding. Does that mean that your baby is small or that there’s something wrong? Probably not. And if you expected to show later but you’re already feeling gigantic, does that mean that you’re going to give birth to the world’s biggest newborn? Yes. I mean, no. Of course not. Also realize that you can’t always compare to what your friends may have said about their previous pregnancies. Some women insist that their bump was showing at 8 weeks. What those mamas saw was a whole lot of bloat, not baby. #isntpregnancyglamorous? Though these are indicators, it’s impossible to say for certain when someone is going to show. Everyone is different. If you are at all concerned about your belly size and need reassurance, please consult your physician. PS- If you haven’t already, make sure that you sign up for Amazon’s baby registry to get your free welcome box. And remember, gaining a healthy amount of weight is important in pregnancy. See the video below for more information.